The benefits of global agriculture are many, for both producers and consumers. Top contributions include the growth of various food products and integration into non-consumables, such as ethanol from corn and paper from trees and plants. Don’t forget about soybeans either; they have numerous uses, from candles to cooking oil and feed for animals. World Agriculture Day is a way to give thanks for the abundance that agriculture produces, on a global scale. Often called Ag Day, this year it will take place on June 11, 2018. Its mission is to connect people with the agriculture that feeds us daily, with a focus on smart approaches based on science and awareness. Ag Day serves as an annual reminder of the value of farmers’ work, both domestically and on a global scale, and encourages growth at their farms, as well as spreading correct knowledge about agriculture and nutrition. By choosing local food resources and eco-friendly agriculture, each person can make a positive difference. This is especially true in the U.S., which is the largest exporter of food. A key part of agricultural equipment are the rotating pieces. Our agricultural bearings perform with the toughness you expect and rise to fulfill demands of tomorrow. They meet regional and global agricultural industry requirements, for both our standard and proprietary designs. Choose from hex bore, round, and square bore bearings for your specific agricultural machine. The bearings are integral to combines, mowers, seeders, balers, tillage equipment and more. 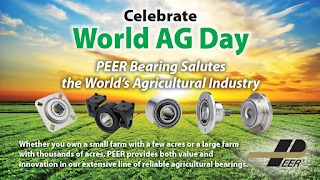 Our agricultural bearings feature long-lasting, durable construction and high performance seals. As a result, machinery operators can expect to save money over time as the bearings do not need replacing as often and experience less downtime. 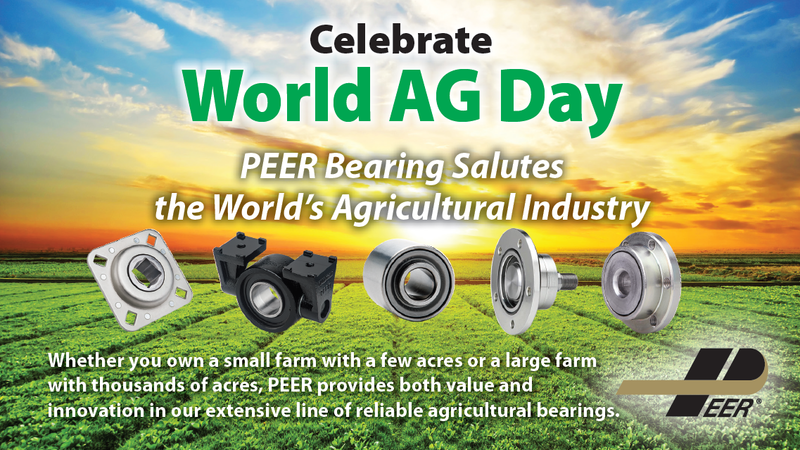 PEER Bearings celebrates smart agriculture on a daily basis, with special recognition to it on World Agriculture Day. By raising awareness for the industry, our planet can continue to prosper and maintain strong local and global economies. We are a trusted leader worldwide for our reliable, strong and affordable bearings across numerous sectors, with multiple quality and service awards to date. Learn more about our agricultural bearing solutions now.